Democratic presidential candidate Sen. Bernie Sanders, I-Vt., speaks during a rally in Fairfield, Iowa, on April 6. Vermont Sen. Bernie Sanders released 10 years' worth of tax returns Monday. The documents underscore how much money the populist presidential candidate has earned in recent years, as his public profile has risen. 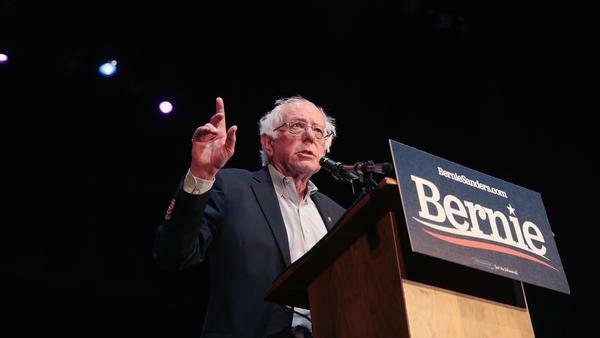 In an interview with the New York Times before the returns were made public, Sanders dismissed the idea that his newfound wealth undercut his billionaire-bashing message. "I wrote a bestselling book," he told the paper. "If you write a bestselling book, you can be a millionaire, too." The tax returns show that Sanders earned more than $1 million recently, making $1,131,925 in 2017 between himself and his wife, Jane, and paying a total of $343,882 in taxes at a 30 percent tax rate. Most of the money came in connection with the book Sanders wrote after his 2016 bid, Where We Go From Here. That year, their adjusted gross income was $1,062,626, and they paid a total of $372,368 in taxes at a 35 percent tax rate. But the royalties from that book have slowed, and in 2018 Sanders and his wife made $561,293. The two paid $145,840 in taxes, or a 26 percent tax rate, and also gave 3.4 percent of their income to charity, donating $18,950. During the 2016 presidential primary, former Secretary of State Hillary Clinton pressured Sanders to release his tax returns. He eventually made his 2014 return public: The document showed he and Jane earned about $206,000 that year, including Social Security benefits. It's been standard for major-party nominees to release their tax returns, but in 2016, Trump became the first general-election candidate in more than four decades to keep his private. Trump has continued to ignore calls to release them, and House Democrats are now trying to use their majority power to obtain the documents from the Internal Revenue Service. As Democrats continue to hammer Trump on the issue, several presidential candidates have made a point of releasing their own financial information earlier than presidential hopefuls have in past campaigns. After Sanders put out the past decade of his taxes, former Texas Rep. Beto O'Rourke did the same on Monday evening, though without his 2018 return — which he hadn't filed yet but said he would make public as soon as he did. In 2017, he and wife Amy's adjusted gross income was $366,455, and they paid a total of $81,019 in taxes for a 22 percent tax rate. They gave $1,166 to charity, meaning they had a 0.03 percent giving rate — the lowest by far of any 2020 hopeful. Sens. Kirsten Gillibrand of New York, Elizabeth Warren of Massachusetts, Amy Klobuchar of Minnesota and Kamala Harris of California, as well as Washington Gov. Jay Inslee, have all already made their 2018 tax returns public. So far, those have shown that Harris and her husband made the most money, paid the most in taxes and were taxed at the highest rate. Warren was the most generous.